Perhaps the best glue is Tensol Cement which joins plastics such as perspex together permanently. 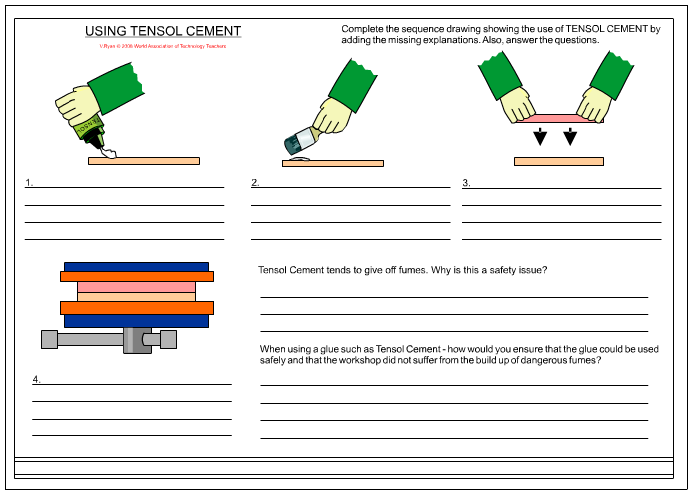 Tensol cement is a type of glue called ‘dichlormethane methyl methacrylate’ and produces a chemical weld between two surfaces. The glue is applied to the surfaces to be glued and they are pressed together. They should be clamped for 24 hours and this gives a permanent joint. Contact adhesive can be used to join plastics. The adhesive is applied to both surfaces and when the surfaces appear to be dry they are pushed together. If the two pieces of material are left for a number of hours, they are virtually impossible to take apart. Many adhesives are plastics themselves. A good example is ‘Araldite’ which is an epoxy resin that hardens when a second chemical is added (called a catalyst). It can bond most materials including some plastics. The two tubes can be seen in the diagram. An equal amount of each tube are mixed together and then applied to the material to be glued. Super glue (cyanoacrylate)is another adhesive that joins plastics together, very quickly. Great care must be taken when using this type of glue as it will just as easily glue fingers together. For this reason super glue is not used in schools. A glue gun can be used to join a variety of plastics. This glue usually gives a semi-permanent joint as surfaces glued together can sometimes come apart. The glue is a type of plastic that melts when hot and solidifies when it cools. Be careful to select that right type of glue stick - this depends on the material to be glued. General purpose glue sticks are usually used in schools. Liquid solvent is applied using a brush or a syringe (often supplied with the glue). As it is a liquid, it is drawn along joints and surfaces through a process called capillary action. Care must be taken, as the glue damages exposed surfaces (as it melts the surfaces of the materials forming a ‘weld joint’). Ventilation is vital when using all these glues. Ideally an extractor should be used to extract all the dangerous fumes. Tensol cement is 'squeezed' onto the surface of the first piece of plastic. This is repeated with the second piece of plastic. A brush or a spreader is used to spread the tensol over the entire surface of the plastic (both pieces). The two plastic surfaces are pressed together. Notice how the top piece of plastic is moved from left to right - this should squeeze away any air bubbles. Both pieces of plastic are then pressed in a vice. They should be left twenty four hours before taking out. This glue is very strong as it 'fuses' both surfaces of the plastic together. 1. Explain why ventilation is necessary when using adhesives. 2. Which glue would you use for Perspex ? Explain with the aid of notes and diagrams how this glue is used.